House Financial Services Committee now becomes the How Can We Get Trump Committee. California Democratic Rep. Maxine Waters announced in her first major policy speech since taking the reins of a powerful House committee that she will target acting White House Chief of Staff Mick Mulvaney. “The time for accountability for his actions is about to begin,” Waters said Wednesday at an event hosted by the Center for American Progress, a progressive think tank. Waters took the gavel of the House Financial Services Committee after Democrats regained control of the House of Representatives. 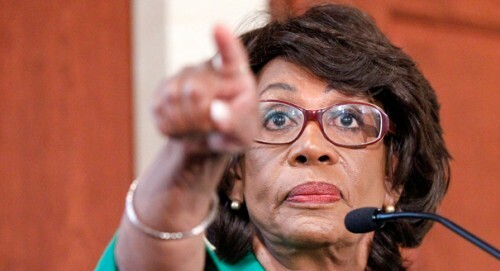 A longtime critic of the Trump administration, Waters vowed to hold hearings involving other White House officials, and also plans to target the banking industry. The California Democrat has taken issue with Mulvaney’s tenure as the interim director of the Consumer Financial Protection Bureau (CFPB), an agency he lead from November 2017 to December 2018. Waters suggested he tried to dismantle the CFPB by rolling back fair housing safeguards and protections for consumers.